When I started this post I set out to answer a very simple query: what is the oldest photograph we have of a real reader interacting with a medieval manuscript? 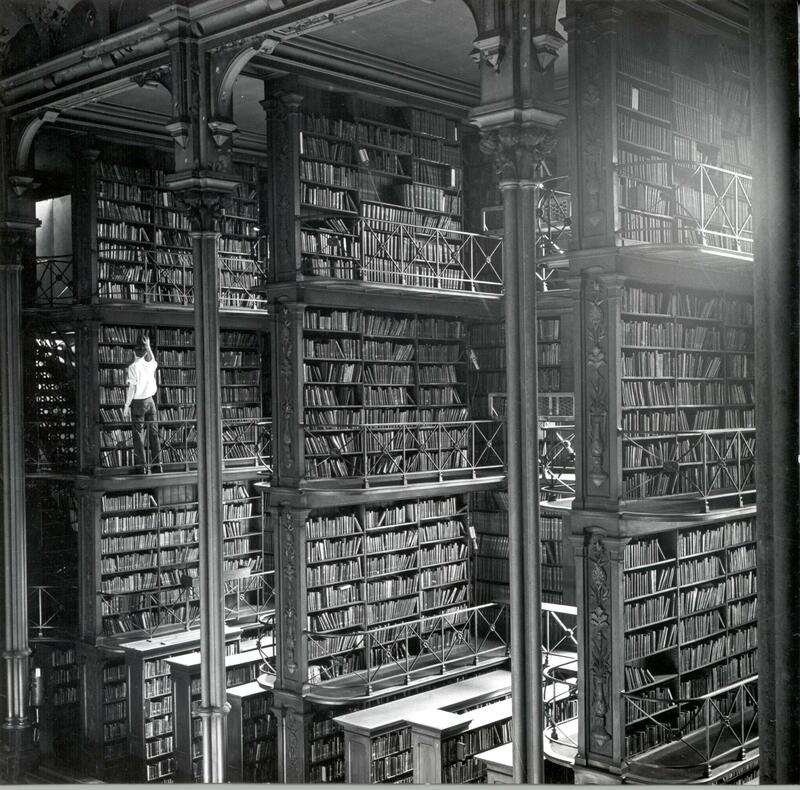 The quest was sparked by a 19th-century photograph I tweeted last weekend of the Cincinnati Public Library, a picture that is both attractive and powerful. It takes us into a large, dark room, with high ceilings. Light is sprinkled over high stacks of books, which look like matchboxes. Cast-iron pillars hold up the ceiling and give the place the appearance of a cathedral, where readers come to worship the book. In front of a bookcase we see a man taking a book off the shelf. Wearing a white shirt and contrasting sharply with his dark surroundings, he is demanding our attention: the reader is the focus of this scene. The photograph looks unreal, more likely taken at the set of a Dr. Who episode than in a late-19th-century library. The reason why the image appeals to me, however, is not just because of the otherworldly nature of this black-and-white world of reading, it is also the fact that this moment is now gone. The thrill of this photograph is that it captures a real moment where a reader in the past, an individual who lived long enough ago to make him part of history, interacts with a book. 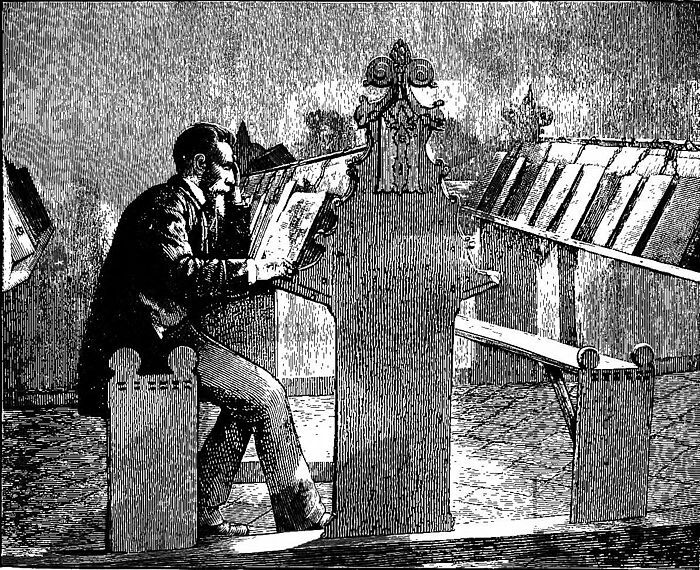 The black-and-white image forms, as it were, a visual piece of reception history, as do the other 19th-century photographs in the Flickr stream of the Cincinnati Public Library, which showcase the inhabitants of this cathedral of the book in different settings of reading. How marvelous it would be to see past generations interacting with medieval books. What powerful images they would make – looking at Tolkien thumbing through the Beowulf codex, seeing Cotton wandering through his magnificent library, or watching Louis IX of France learning to read from the famous Leiden Psalter. Old photographs do provide us with such “live” scenes, but there are only very few. Two of them show a reader interacting with the early-13th-century Codex Gigas or ‘Devil’s Bible’, the largest book to survive from the medieval period and currently kept in the National Library of Stockholm. Weighing 75 kilograms and measuring an astonishing 890×490 mm, it is as large as a dining room chair, taller than a bike. It was nearly destroyed in 1697 when a fire raged at the Royal Castle in Stockholm, where it was kept at the time. It was saved because it was thrown out of a window, seriously injuring a bystander. As we can read on the left image, the man in the two photographs is Gustaf Liljegren, “machinist” (engineer). The pictures give us an inkling of what he thinks of the book: he seems in awe and proud to be able to hold this giant among medieval manuscripts. He was probably asked to stand next to the book to put the object’s size in perspective. 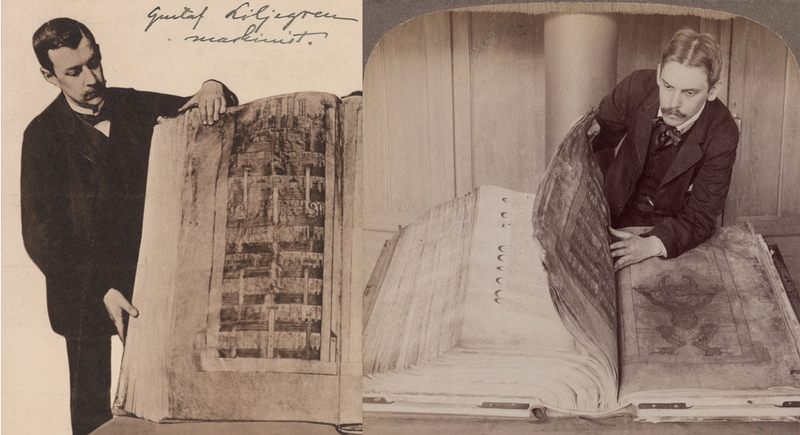 In the picture on the left he poses next to it, gently holding open the book at the page depicting Heavenly Jerusalem. He gazes at the image, as if to steer our eyes towards it. In the picture on the right he seems to study the book, while leafing through it. This scene is also posed, of course, because the manuscript is facing the photographer, enabling us to see the two illuminated pages of the book. We can even go further back in time to meet other readers if we move beyond the photograph. A 19th-century engraving from J.W. Clark’s Libraries in the Medieval and Renaissance Periods captures a gentleman reading a manuscript in a chained library – producing a very odd scene. Then there are paintings, such as the one in which Humfrey Wanley, scholar of Old English, thumbs through an Anglo-Saxon codex. His arm is lifted just a bit too high for comfort: here, too, the reader poses proudly with the medieval book, showing it off to us, the beholders. The perhaps most powerful painting is Rogier van der Weyden’s “Man Holding a Book” (c. 1450). This medieval scene has a very modern feel to it, in part because the reader’s face looks so modern. You could have talked to this guy when you were in the bookshop yesterday. What the readers in both the photographs and the paintings share is the desire to show off their treasures. 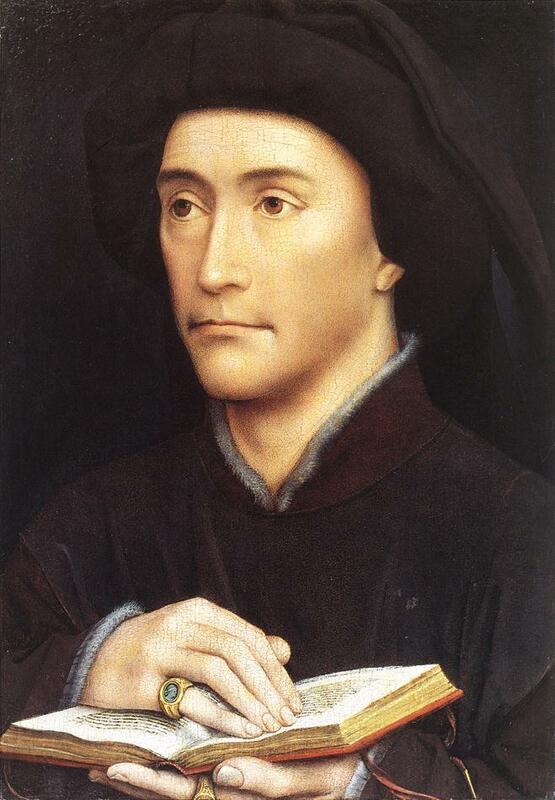 The clear-eyed man in Van der Weyden’s painting does so most vividly. His hands lift the book up high, so as to make sure that the most important part of the painting is visible to us. The object is as dear to him as the only other object that features prominently in the painting, his shiny golden ring. Both book and ring are expensive and affordable only by few, which is no doubt the subtext of their presence in the picture. As his counterparts from the 17th and 19th centuries, he is a proud reader.